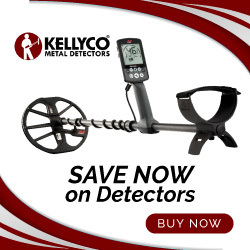 In my previous post on this subject I told you a bit about the oldtimer Walt H., the mining tools he used, and what sort of gold-bearing streams he worked. 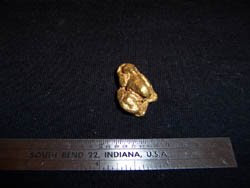 In this post I'll outline Walt's theories and methods for finding large amounts of placer gold nuggets over time. I spent many hours with Walt, watching him work and listening as he disclosed his "little secrets." None of these were magical or mysterious, they were simply approaches that he had explored, developed, and honed over time until they were second nature. And, all were based on solid theoretical knowledge as well as a great deal of experience. 1) "I work the littler creeks and streams 'cause they're easier to handle, usually running less rapid and shallower, so I can get at most of the spots I need to. But first off you need to make sure the stream was a nugget producer in the old days." 2) "When I look at a gold creek I want to see water flows that change from fast to slow and that have good twists and turns in them. And drop offs or little rock shelves that ain't too high help too. All these things make good gold drops. A stream that's too fast, or too steady, or that doesn't change much doesn't trap the gold good. And forget streams that don't flood very much, 'cause the bigger pieces of gold don't get moved around like they should." 3) "Big rocks or boulders in good parts of the stream are what I tend to look for. If clay layers or shallow bedrock is there, that's even better. But you don't need the bedrock, just a good obstruction sitting in the right part of a stream or creek with lots of good rock and gravel packed behind it, around it, and underneath it." 4) "I'll sample a bit behind and around that rock or boulder and see what turns up. If the water's deep I'll use the highbanker suction hose, otherwise I'll just dig up some of that material with a shovel and pan it or sluice it to see what's there. If it looks good I'll set up my 'come along.'" 5) "I couldn't mine nuggets without my 'come along.' I'll set up one hook around a big tree that's close by and then the other around that boulder or big rock. It doesn't matter if the boulder is in water or sitting high and dry, you need to pull that thing out and away. Because what you want is directly behind and underneath it." 6) "Those nuggets and coarse pieces can be anywhere under or close around that big rock. If there's overburden you may find them squeezed between rocks in layers going down, 'cause they've been dropped there during the winter storm floods or snow melt. And since that creek or little stream ain't like the big rivers, those nuggets tend to stay right there unless something big jolts them out and down." 7) "Now if a nugget or two shows up, then good. Keep on digging or sucking down as far as you can. If there's clay there or bedrock, then you got to clean every bit of that up. Usually there'll be some good coarse gold there, especially in cracks or crannies, so clean those things out till they shine. Now if somehow you end up in a 'dry' hole, then pack it in and try another spot. What one boulder may not have underneath or behind it another will. So don't give up." 8) "Hunting nuggets and coarse gold is hard work, just like all mining. Using that 'come along' to move a big rock and digging things out takes time and you got to put your back into it. But the rewards are good too, once you learn the ropes and do what you need to do. For me, mining this way is fun and I tend to get bigger and better gold overall, even if it's a bit less than if I was dredging in a river. Hell, I'm getting to be an old bird now and I just want to do it my way...."
So there you have it. Pretty much straight from the heart, mind, and mouth of an oldtimer that knew his stuff and knew it well. I know, because I was with Walt on nugget hunts on multiple occasions, and he always came away with at least one or two "chunkers," if not more. How many of us can say we always return from our mining forays with nuggets of any size? Walt also showed me 2 large mayonnaise jars nearly filled to the brim with coarse flakes and small and medium-sized placer nuggets he had recovered using this method over the years. He also told me he had much more safely locked away. Based on what he taught me and direct observation, I tended to believe him. I've given you enough thus far to get you started. Needless to say, some of Walt H.'s "little secrets" still remain with me. Perhaps one day I'll divulge those as well, when the time is right. If you liked this post, you may want to read: "Finding Nuggets the Old-Fashioned Way (Part 3)"